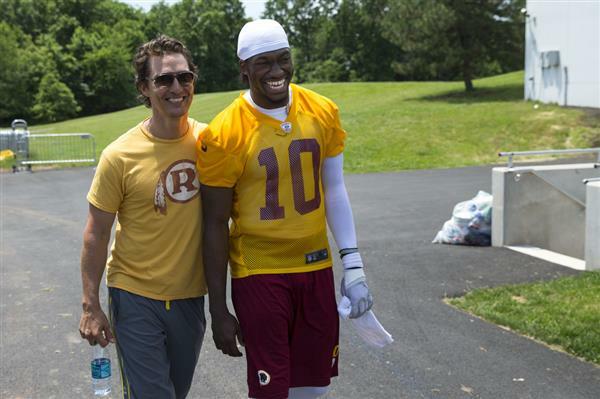 WASHINGTON -- "Interstellar" star Matthew McConaughey is the latest to weigh in on the Redskins name controversy. So what does the Texan think of the moniker? "What interests me is how quickly it got pushed into the social consciousness. We were all fine with it since the 1930s, and all of a sudden we go, 'No, gotta change it'? It seems like when the first levee breaks, everybody gets on board," he tells GQ Magazine. "I know a lot of Native Americans don't have a problem with it, but they're not going to say, 'No, we really want the name.' That's not how they're going to use their pulpit." McConaughey adds that he has been a fan of the team since he was a child. In fact, he visited the team this summer. "I love the emblem. I dig it. It gives me a little fire and some oomph. But now that it's in the court of public opinion, it's going to change. I wish it wouldn't, but it will," he says.